The simple answer is because there is no other luggage like Tumi luggage. Some say you have truly "arrived" if you travel with Tumi bags. Tumi calls it the Tumi Difference. What Does The Tumi Brand Stand For? The Tumi brand is a leading international brand of luxury travel, business, and lifestyle accessories. Tumi success is due to their constant focus on design excellence, technical innovation, functional superiority, and growing product collections. Tumi is for those that want only the best. The first thing you notice about Tumi luggage is the design. Tumi bags are always stylish and in a timeless way. The design is modern but still classic. Tumi bags not only look great. They are designed with the needs of the demanding traveler in mind. The latest edge technology is used to offer functional superiority. Whatever it is performance, organization or design... Tumi delivers. The Tumi design excellence means owning a Tumi bag is something to be cherished in the years to come. Tumi bags do age gracefully and everyone can tell that this is a top quality piece of luggage. Product development and technical innovation is one of the strong points of Tumi. Their products are made from hundreds of custom designed parts, many exclusive to Tumi and all designed with the highest quality standards in mind. Tumi knows their customer base and knows what their customers want. Tumi products are designed with the demanding traveler in mind. Tumi customers want high quality and stylish luggage but they also want a luggage with functional superiority. Whatever it is the ease of maneuvering the bag around busy airports, the internal and external organization (easy access dedicated compartments), or something else... Tumi has thought of it and delivered. Tumi understands that not all customers are the same and their product collections represent the different needs and style of their customers. Tumi has in recent years included more product collections, more colors, more styles and hence extended their customer base. Tumi product range now includes carry-on and check-in bags, business cases, briefcases, laptop bags, handbags, backpacks, etc. 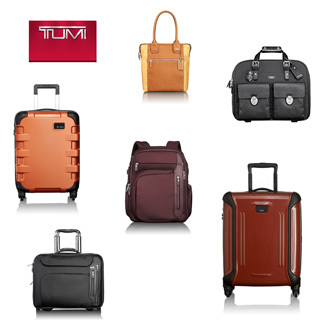 Everyone can now find Tumi bag for his or her needs (and wants). Tumi Tracer® Product Recovery Program is an exclusive, complimentary program that helps reunite Tumi customers with their lost or stolen items including luggage and business cases. Tumi puts a metal plate with unique 20-digit registration number on all their bags, which allows the bag to be reunited with you... as long as you register your details with the Tumi Tracer program. Tumi bags are excellent choice for anyone looking for top quality luggage. Tumi bags always look good. They are stylish, elegant, glamorous, and tasteful for any occasion. The Tumi image used to be executive business traveler on the move. New product collections means wider customer base. Tumi products are now popular among luxury leisure travelers as well. Moreover, their women's collections means women are increasingly opting for Tumi bags. Amazon offers wide range of Tumi bags. These are some B for Bag of favorites.